Let the games begin. Here is an excerpt from a Huffington Post article written by Nancy Altman. The argument, not for dealing with the long-term funding requirements of Social Security, but expanding it, will be in the forefront of the presidential political debate. It sounds so simple, we can expand (undefined) Social Security if only we tell the wealthiest to pay a little more, their fair share as defined by the political left. The argument below is what is truly questionable. Of course we can afford to both fix and expand Social Security. All we have to do is raise the payroll tax on every worker in the US. In other words, tax their money from today’s spending for their future income security. 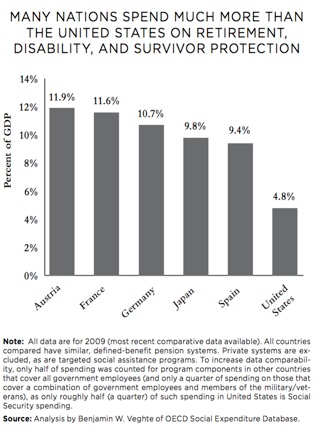 We can spend as much of the GDP as we want on entitlements. But what these supporters fail to mention is that in these other countries everyone pays higher taxes, much higher than in the US. They pay a 20-22% or so sales tax, they pay generally higher income taxes and they pay an array of fees and other taxes. And they also pay additional premiums for their government health benefits. What you hear in America is not the truth, but rather that Americans can have it all if we simply get the top 1% to 6% of our citizens to be our benefactors. The fact is that the average senior citizen is doing quite well. Many measures of senior income do not account for all their wealth or even all their income income. Social Security was never intended to fully fund retirement. Lowest income seniors with minimal Social Security benefits were almost certainly among the lowest income all their lives. We can’t solve a lifetime of income problems in the years after age 65. Using the word “expand” creates great expectations, but have you ever heard what proponents mean by expanding benefits and for whom? As our senior population is projected to grow from 12 percent to 20 percent, Social Security’s costs, as a percentage of GDP, remain basically a level, horizontal line. The “Note” at the bottom of the chart brings up a number of questions: government employees, military, private systems, targeted social assistance programs? When you look at the implications of those exclusions or qualifications, the percent of spending shown in the chart looks highly dubious. The title at the top of the chart should read: Nations spend much more than the United States if you ignore a whole bunch of stuff that the United States spends money on that other countries don’t spend money on.